Aunty Thelma and Captain Mike! Aunty Thelma joined Captain Mike aboard the Maggie Joe tonight on a family sunset cruise. Aunty Thelma, sister to Maggie Joe founder’s John and Eddie, showed off her sea legs and spent the night cruising up on the bridge with Captain Mike. We enjoyed having everyone aboard and we love you, Aunty Thelma! 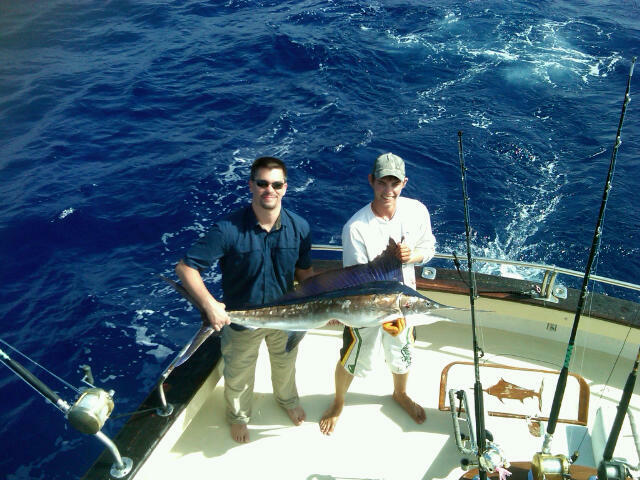 Dan with his first Striped Marlin aboard the Maggie Joe! 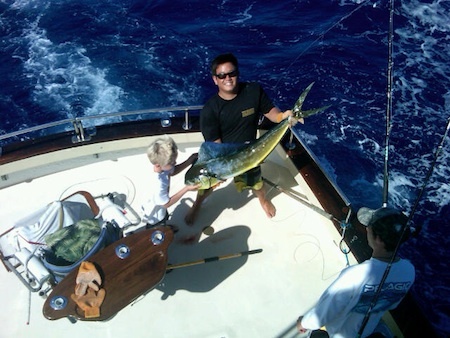 Mahalo to Dan for choosing Maggie Joe Sport Fishing! Dan spent the day with Captain Mike and Deckie Johnny-bobo while on a sport fishing charter aboard the Maggie Joe. While deep sea fishing outside of Honolulu, Oahu Dan hooked up with his first billfish, this nice Stripey! Aloha and congratulations! The Nevjahr Family and their Mahi Mahi! 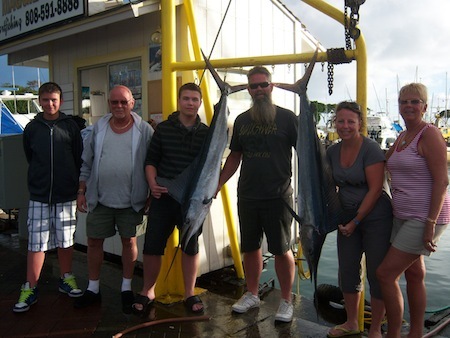 Mahalo to the Nevjahr Family for choosing Maggie Joe Sport Fishing! The family spent a day out on the water aboard the Sea Hawk on a sport fishing charter with Captain Darryl. They hauled in this nice Mahi Mahi while deep sea fishing outside of Waikiki, Oahu! Aloha and Go Big Red!! Soon Family with their Mahi Mahi and 65 lb Ulua! Mahalo to the Soon Family for choosing Maggie Joe Sport Fishing! The family departed Kewalo Basin, next to Waikiki, the day after Christmas aboard the Maggie Joe with Captain Mark and Deckie Johny-bobo on a successful sport fishing charter. While deep sea fishing outside of Honolulu, Oahu they hauled in a Mahi Mahi and a nice 65 lb Ulua! Great job and aloha! Angler Marc and his friends with 3 Stripey's! Angler Marc had a great day aboard the Sea Hawk with Captain Darryl while on a sport fishing charter. He hauled in these 3 Striped Marlin while deep sea fishing outside of Honolulu, Oahu! The largest of the 3 came in at 75 lbs. Congratulations and Aloha! Pike with his first Mahi Mahi on the Maggie Joe! Pike with his first Marlin aboard the Maggie Joe! We had a great day aboard the Maggie Joe on a sport fishing charter with little Pike. Pike did a great job hauling in his first Mahi Mahi and Blue Marlin while deep sea fishing outside of Honolulu, Oahu with Captain Mike and Mate Mikey. Mahalo and Hana Hou! Mike, Wanda, Matt, Steve, Casey and Brenda with 2 Striped Marlin! 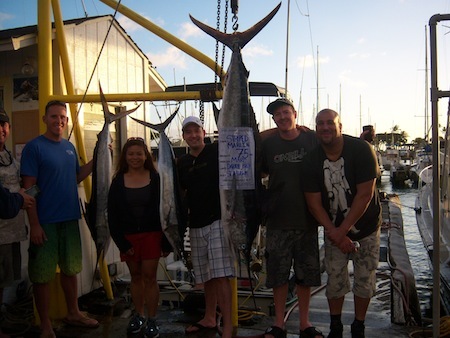 Mahalo to Mike, Wanda, Matt, Steve, Casey and Brenda for choosing Maggie Joe Sport Fishing! The group departed Kewalo Basin, next to Waikiki, on a sport fishing charter with Captain Mike and Deckie Johnny-bobo. 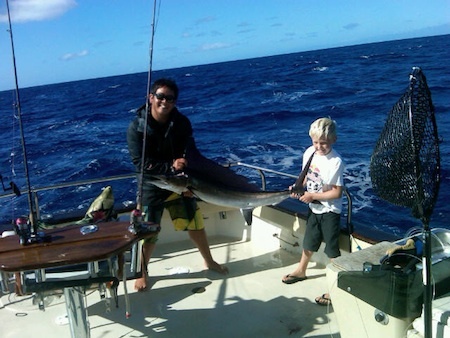 They hauled in 4 striped marlin while deep sea fishing outside of Honolulu, Oahu. They decided to keep two and let two go back and get bigger for next time around! Congratulations and aloha! Angler Ed with Striped Marlin! Mahalo to Ed for choosing Maggie Joe Sport Fishing. Ed joined Captain Darryl aboard the Sea Hawk on a sport fishing charter. 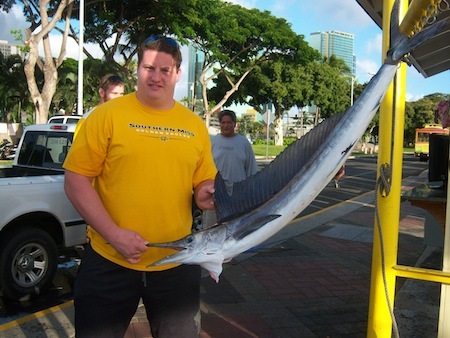 While deep sea fishing outside of Honolulu, Oahu he hauled in this nice Stripey. Congratulations and Aloha! 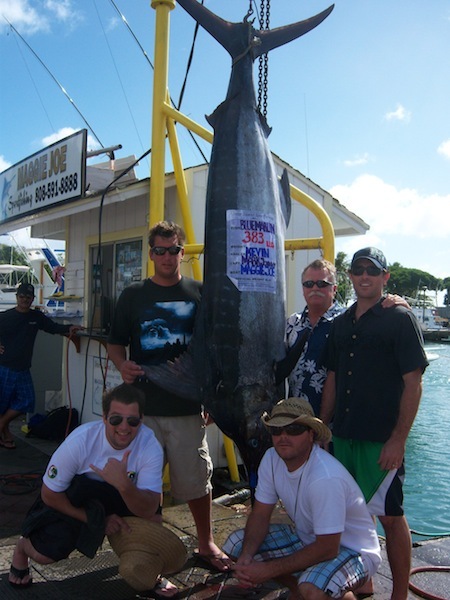 Angler Kevin with his buddies, Mark, Don, Sam and Ken and 383 lb Blue Marlin! 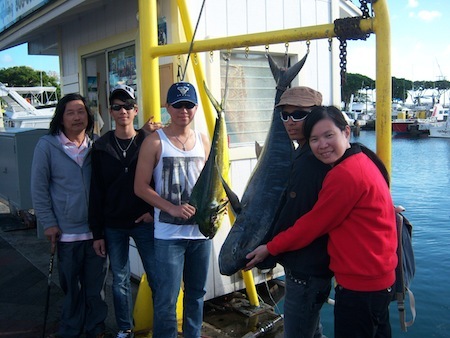 Mahalo to Kevin, Mark, Don, Sam and Ken for choosing Maggie Joe Sport Fishing! The group of friends spent the day on a sport fishing charter aboard the Maggie Joe with Captain Mike and Deckie John. It was another great day, as Kevin hauled in this nice 383 lb Blue Marlin while deep sea fishing outside of Honolulu, Oahu! Congratulations and Hana Hou! 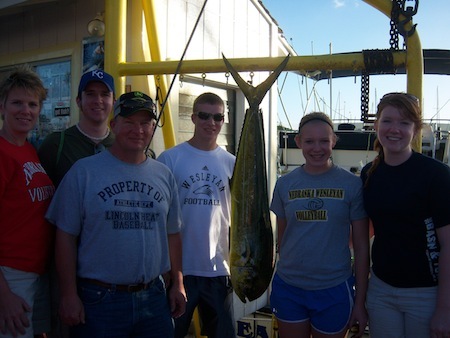 Chris, Lizzie and Jim with 2 Mahi Mahi! 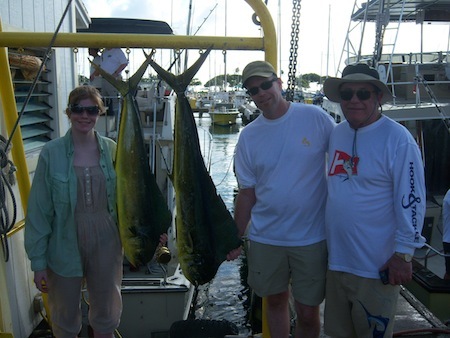 Mahalo to Chris, Lizzie and Jim for choosing Maggie Joe Sport Fishing! The group departed Kewalo Basin, next Waikiki, on a sport fishing charter aboard the Maggie Joe with Captain Mike. They hauled in these two mahi mahi while deep sea fishing outside of Honolulu, Oahu! Congratulations and enjoy !